Audio Archive mp3; Ukrainian Songs, Music mp3; My songs; My Reciting and Theatrical Works. Аудіоархів mp3; Українські пісні, музика mp3; Мої пісні; Мої читецькі та акторські роботи. 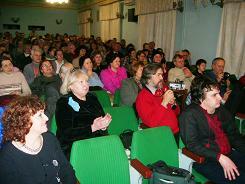 The concert was held in the Cultural Centre of Kyiv Mohyla Academy 28.05.2009, at the birthday of Kost’ Yerofeev. 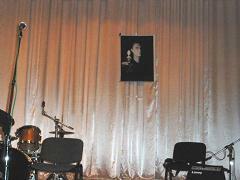 His friends and collegues-musicians performed songs and shared memories about Kost’. 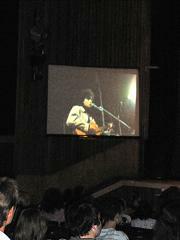 I have recorded only the part of the concert because I had to leave immediately after my presentation. Audio files from this post can be uploaded from the pages: Ukrainian Songs, Music mp3; My Reciting and Theatrical Works. Аудіофайли з цього поста можна завантажити зі сторінок: Українські пісні, музика mp3; Мої читецькі та акторські роботи. 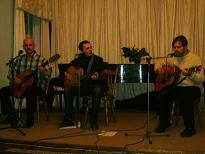 The concert was held 25.02.2009 in the Writers’ House. In the first part, devoted to the birthday of Tryzuby Stas, Eduard Drach has presented 1 song, Oleh Sukharev – 2, and I have recited 3 of my poems. The second, and the main one, part included “Ruthenia” presentation. Unfortunately, the sound was not too clear, so I post only some audio from the concert.